There are some awards that are long and then there are the NASCAR awards, yes this one was a little on the long side last night, but star studded and full of great tributes to those who have made 2016 in racing one to remember. Tonight we said goodbye to Sprint for their 13 years of sponsorship for the last time and also bid Tony Stewart farewell from racing as a driver. For some, this was the last driver that dated back the late 90’s and early 2000’s of racing when anything goes attitude was on the track. Stewart will continue to be on the track in 2017 as part of his Stewart/Haas Race team hits the track running and ready. Stewart even had a big surprise as he was joined on stage by the legendary Eddie Vedder, who was later presented with a surprise of his own, a check for 1.8 million for his EV Foundation from the Hendrick Motorsports team. 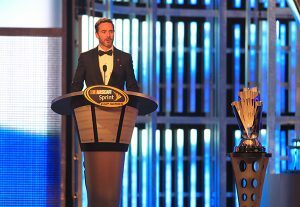 With all of the amazing performances which included an opening by Sting, the night was still about Jimmie Johnson and his 7 Championships. It took someone who has won a lot of something himself to introduce Johnson and the second surprise of the night was Michael Phelps, who knows a little about winning himself. Johnson who just wanted to grow up winning one Winston or Sprint Cup Championship now has seven. Dale Jr to Retire at End of 2017, What Does this Mean for NASCAR?